This article first appeared in PARAMETERS: US ARMY WAR COLLEGE QUARTERLY, Vol. XXV, No.3, Autumn 1995. Permission has been given to the Getysburg Discussion Group for use of this article. Lieutenant Colonel William Terpeluk, USAR, is commander of the 1079th USAR Garrison Support Unit, Fort Indiantown Gap, Pa.. He is a 1995 graduate of the U.S. Army War College. A graduate of the Virginia Military Institute, he also holds an M.B.A. in organizational behavior from Drexel University. During the battle itself on the first three days of July 1863, the Union Army of the Potomac under Major General George G. Meade fought on the operational defensive. The Army of Northern Virginia under Robert E. Lee had been in the midst of its Campaign through Pennsylvania when it engaged the Union army during that pivotal battle. Meade, in command of his army for less than a week. decisively countered the moves of his seasoned opponent. Lee's army was defeated, and Meade's thoughts turned to his next move. Besides the friction normally associated with sustained combat operations, other factors were to influence the actions of both sides subsequent to Gettysburg. From the perspective of the Confederate commander, heavy rains would force a stand with his back against a very formidable river. From the perspective of the Union commander, Meade would not only be hampered by mountainous terrain and the same rainy weather, he would also be strongly influenced by political considerations. Given the importance of Washington, D.C., and its proximity to hostile territory, the protection of the capital had been a prime consideration in military planning since the start of the Civil War. As decisive as the results of the third day of the Battle of Gettysburg were, the Confederate army remained an effective fighting force. General Meade was acutely aware of this, and carefully planned his future operations for his Army of the Potomac with that in mind. He could not have known it then, but his newly won luster was about to fade in the eyes of President Abraham Lincoln and General-in-Chief Henry W. Halleck. With their expectation of a complete defeat of Lee, Meade was hard-pressed to deliver the coup de grace that his superiors considered to be just within his grasp. Although the unscathed Union VI Corps was available as a counterattack force against Lee's right flank, it represented Meade's only usable reserve. Considering that fact, as well as the overall condition of the Union army, he subsequently decided in favor of a larger maneuver through Middletown, Maryland, across South Mountain, and to Williamsport. Maryland, along the Potomac River. As shown on Map I on the next page, Meade's intent was to intercept Lee along his anticipated line of retreat back into Virginia. surprise if it were to destroy (as opposed to defeat) the Army of Northern Virginia. When this constraint pertaining to the protection of Washington was removed a year later, the maneuver possibilities for the Union army increased. It was U. S. Grant, not Meade, who would benefit from subsequent opportunities to take advantage of the operational potential of those possibilities. Two days' movement may have been lost by Meade's decision to verify that Lee had indeed retreated south, but a careful analysis reveals the sound rationale for his prudence. He was preparing to pursue an enemy army that he believed at the time still to be superior in strength to that of his own.5 He displayed no appreciable trepidation about going on the offense under these conditions, but be was determined not to give up the hard-won gains of the Battle of Gettysburg. Had Meade prematurely commenced his overall flanking movement with Lee still remaining in strength in the vicinity of Gettysburg, that position could yet have fallen to the Confederates. Not only would this have been a tremendous military setback to the Union, the psychological and political consequences would have been unfathomable. Considering that Meade would need his entire army for decisive action once he reestablished contact with Lee, dividing his force to both protect his rear and continue his flanking maneuver would not have been practical in any military sense. 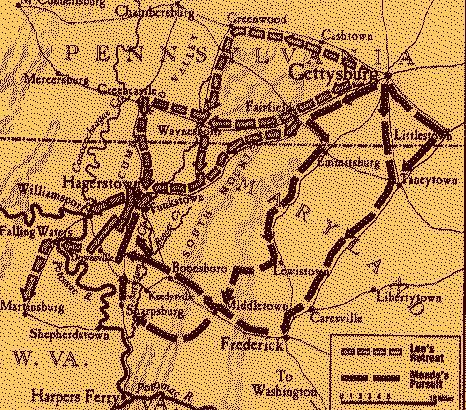 Meade's route of march may seem somewhat circuitous, but the nature of the north-south Catoctin and South Mountain ranges between him and Lee's gave him little real choice With the route through Fairfield Gap too easily defended, the next series of passes through South Mountain are found directly west of Frederick Maryland, about 35 miles south of Gettysburg. Although opposed by the rebel cavalry under a rejuvenated J.E.B. Stuart, the main force of the Union cavalry quickly secured all South Mountain passes and screened the movement of the Army of the Potomac While Meade correctly anticipated the river crossings at Failing Waters (site #1 on Map2) and Williamsport (#2) as potential locations for his next confrontation with the enemy main body, this still did not mitigate Lee's two biggest inherent advantages, favorable positioning and terrain. In the truest Jominian sense, Lee was operating on interior lines throughout the retreat from Gettysburg. He followed the most direct and obvious route to the Williamsport area and made it virtually impossible, even under the most fortuitous of circumstances, for Meade to "steal a march" on the Confederate army. Further, the topography in the Williamsport-Falling Waters area made it a natural defensive position should Lee need to turn and face the Union army. The Falling Waters site is protected on three sides by a series of right-angle turns along the Potomac River. A north-south ridge line dominates the one exposed side of a defensive box (#3 on the map). Williamsport itself is protected from the north and west by the Conococheague Creek (#4). Once safely across the Potomac, the Confederates would be relatively secure from a Union attempt to outflank them, since such a maneuver would require Meade to force a crossing of the river. Consequently both commanders sought the advantage-Meade to deny Lee the opportunity to improve his position, Lee to engage the Union army on his own terms. The Union battle line stretched a dozen miles. During the movement-to-contact, Meade indeed made the proper disposition with his forces to maintain tactical flexibility. He informed Halleck on 9 July that he intended to "keep as concentrated as the roads by which I can move will admit, so that should the enemy attack, I can mass to meet him, and if he assumes the defensive, I can deploy as I think proper." 14Meade was rapidly approaching his most critical decision in this phase of the Gettysburg Campaign where both the nature and timing of his future operations had to be carefully weighed. As focused as Meade may have been on the crossing sites at Williamsport and Falling Waters, he was unable to move his center toward those objectives on a narrow front without courting complete disaster on his flanks. With the existing disposition of Lee's army, any Union maneuver directly along the Potomac to cut Lee off would have dangerously exposed Meade's right flank and rear. Indeed, any Union success in this regard might not even have been a setback to Lee if he used the opportunity to pin the Union army against the Potomac long enough to launch another invasion of the North through the Cumberland Valley. Meade then would have been in the embarrassing position of trying to catch the Confederate force. An attempt by the Union army during this period to defeat Lee by moving to the south side of the Potomac River could have had similar consequences, and in the process uncovered Washington. For a massive Union assault to succeed, two principal planning factors had to be considered. First, from a psychological standpoint, Meade needed to realize that Lee considered him to be cautious. A plan of operation for the Army of the Potomac that could defeat Lee would have to appear to be out of character for the Union general. Meade's only chance for a decisive engagement with the Army of Northern Virginia was tenuous at best. As the Confederate army was essentially conducting a phased withdrawal, it would no longer pose an offensive threat to Meade when its left flank had been pulled back to the area around Williamsport. Therefore, Meade's "window of opportunity " would be after the Confederate left flank had been withdrawn but before an extensive line of entrenchments could be established to protect Lee's troops as they forded the river at Williamsport. The Downsville position confronting the Union left had been the most static during this period and would be the most prepared. As events would soon prove, Meade's best chance would entail a concentrated assault on his right, along the Funkstown-Williamsport axis, as the retrograde movement of the Confederate left was actually being conducted. Meade eventually would decide on the Funkstown-Wiliiamsport approach for his main attack, but undue caution may have got the best of him at this point. After concentrating the army on 10 July he chose to maintain the bulk of his force in those positions for an additional day as the Union cavalry continued its aggressive screening to the northwest. 19 As he stated to Halleck late on 12 July, "Upon advancing my right across the Antietam this morning, the enemy abandoned Funkstown and Hagerstown. "20 The enemy in this case was the Confederate II Corps under General Richard S Ewell. The brief window of opportunity quickly closed, as Ewell reported that his corps soon "began fortifying, and in a short time my men were well protected. Their spirit was never better than at this time, and the wish was universal that the enemy should attack." 21. Could Meade have attacked sucesfully without risking a catastrophic loss to his army? With our knowledge of Meade's concept for the upcoming battle, a plausible scenario for Union success can be envisioned if the Army of the Potomac had moved to its right a day earlier as opposed to the actual movement on 12 July. Had Meade initiated his next planned movement on 11 July instead of choosing to stay in position, he would have been able to take full advantage of Ewell's withdrawal from the Funkstown area. A Union movement at that time would not have been premature and would have entailed entirely acceptable risk based on Meade's knowledge of enemy positions and intentions. Should Lee sortie from his prepared position near Downsville, a weakened Union left or center could still effectively use the series of north-south ridges and creeks to defend or delay. With a river to restrict Lee's movement to his right and the Union-held South Mountain to his eventual front, the Confederate commander would put his army at great risk with very little chance to gain by such a maneuver. In this scenario, the operation would begin by occupying attack positions in the Funkstown area on the morning of 11 July. The main attack, ideally reinforced with a fourth corps, would begin on 11 July or, at the latest, the morning of 12 July. An additional corps would be held in reserve. A division-sized cavalry force would simultaneously conduct a demonstration or probing attack on the south bank of the Potomac. The cavalry raid would be similar to that which was actually launched from Harpers Ferry on 14 July by Brigadier General David McGregg's division 30 but with the intent to distract and confuse Lee. After rapid concentration of the attacking force, the main Union attack from Funkstown would have to be pursued vigorously. Should the Union attack lose momentum, Confederate forces could rapidly shift along interior lines in a manner similar to that at the Batttle of Antietam. 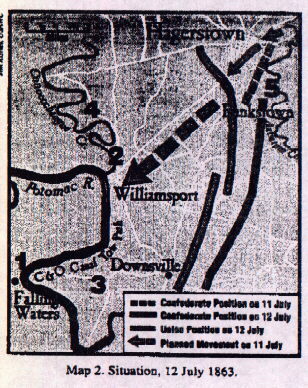 Nevertheless, a Union attack that would capture Williamsport and its fording site would force Confederates into the Downsville salient and allow the possibility of further Union operations across the Potomac River. In all likelihood, of course, other factors might have prevented success of this hypothetical scenario. It would have required an almost impeccable sense of timing and coordination. Meade had lost two of his most dependable senior leaders at Gettysburg. Further, the collective Confederate leadership was just too great to permit itself to be caught in such a trap. This combination of factors, which justified to some degree Meade's caution, was not sufficiently appreciated by Lincoln. Despite Meade's cautious nature, the chances of destroying the Army of Northern Virginia as it retreated across the Potomac after Gettysburg would have been relatively low under the best of circumstances. Nevertheless, Meade's star was on the decline. Meade's style of competent but low key aggressiveness did not seem seem to appeal to a President who needed quick and complete victories. To Meade, his own reputation meant far less than his sense of duty. He also considered himself completely above politics and self -aggrandizement.,37 running the ultimate risk of being overshadowed by a different breed of general by the end of the Civil War. The results of the Gettysburg Campaign both military and political have been debated for the past 130 years. Somewhat more problematic, however, is the change in the strategic balance that might have arisen had Meade been able to inflict more damage upon the Confederate army. Shortly after the Gettysburg Campaign, the Confederate I Corp, under Lieutenant General James Longstreet, was sent to reinforce the Confederate Army of Tennessee. While Longstreet's Corps would play a key role in the Southern victory at Chickamauga Creek in September 1863, the overall failure of the Confederate effort in the Chattanooga Campaign negated the strategic advantage of the reinforcement from the Virginia theater. When Meade next confronted Lee, the Confederate army would indeed be smaller, but the Army of the Potomac also would be hampered by the detachment of Meade's XI and XII Corps to Chattanooga as well as troops to quell the draft riots in the North38 In a strategic sense, had the Army of the Potomac sustained large casualties during an attack of 13 July, the inability to divert these two corps to the Chattanooga Campaign would have altered the balance of forces in the west, raising the possibility of an eventual Union defeat in that theater ,this could have drastically altered the course of the Civil War. When put in the context of the entire Gettysburg Campaign. Meade's inability to fully maintain the momentum of his pursuit can be understood, if not forgiven. After all, his adversary, Robert E. Lee, already had proven himself to be a master of initiative under desperate conditions. Lee's own battle tempo had been lost only by an act of nature , the flooding of the Potomac River. Still the pursuit of Lee demonstrates the importance of the subtleties in battle command where one delay in movement can have an irreversible effect. As far as Meade's generalship is concerned, it can be determined only after reviewing his performance in subsequent campaigns and battles. While Gettysburg began the legacy of George Meade, his real fame would be gained or lost along Mine Run, in the Wilderness, and around Petersburg. 2. War department, The War of the Rebellion. A Compilation of the Official Records of the Union and Confederate Armies, series 1, Vol XXVII, Part 1(Washington D. C., GPO. 1889: rpt Harrisburg Pa: The National Historical Society 1971), p 61. Hereinafter O.R. 13. O.R., XXVII. p 147. 15. O.R., XXVII. pt. 1, 147. 16. Edwin B. Coddington, The Gettysburg Campaign: A Study in Command,( New York, Charles Scribner's Sons, 1968),p566. 21. Ibid, pt 2, p. 448. 22. Ibid, p, pt 1.p 91. 30. O.R., XXVII, pt.1, 93. 32. O.R. XXVII pt. 1, 93. 38. O.R., XXVII pt.1, 105-06. 39. Freeman Cleaves, Meade of Gettysburg (Norman, University of Oklahoma Press, 1950 ),p. 185n.